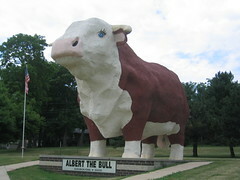 I think the slogan on Albert, World’s Largest Bull, nicely sums up what kind of roadside attraction Albert is: “There’s a whole lot of work behind this much bull!” He isn’t just an attraction he’s a work of art. Since Albert currently resides in the heart of beef country it’s fitting that he was contructed to “honor the nation’s beef industry.” Built in 1964 Albert is a Hereford cow, mainly because these are some of the prettier cows (I didn’t know there were ‘prettier’ cows either.) The town, the Hereford Association and the local Jaycees all pitched in to create Albert. Albert proudly stands 15 feet tall, spans 33 feet long and weighs in at an impressive 9 tons. 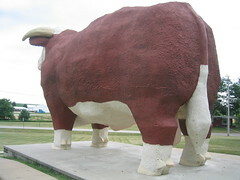 He is still well-maintained by the town and is at the end of a lively park. There is a whole covered area where you can read about Albert’s construction and listen to Albert speak about his life. You heard correctly, there is a recording of Albert. Definitely tops on the list of Iowa roadside attractions.